Here is another simple recipe for Thanksgiving or Christmas. 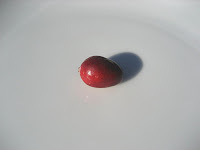 I am not a cranberry fan, but people seem to lick the spoon for this one. 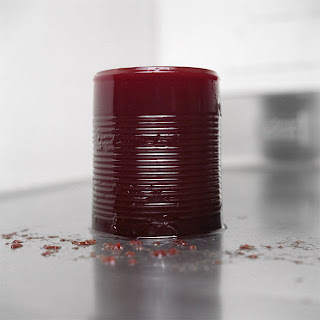 I know there are some people that can't give up their canned, sliced cranberry sauce. I don't think this recipe even resembles that can of disgustingness jello-like congealed condiment. This is fresh, a bit spicy and you can make it a week ahead! Combine all ingredients in a heavy saucepan. Bring to a boil and stir until sugar dissolves. Lower heat and simmer for about 15 minutes. You can mash some of the berries if you like. Transfer to a bowl and cool. Garnish with shaved orange peel. You can keep this in the fridge for a few weeks. It's like jam. A good idea: Spread some goat cheese on crostini and top with a little cranberry relish! A nice Christmas appetizer IF you have any left! I have never been a canned cranberry fan. But homemade like this one is another story. Looks great. Same recipe. We love it. Rose has made it for years. This year she's making a cranberry-beet relish. I'll let you know how it is! Hi Stace, Mine's similar, but I never added ginger, nice idea! Although, I have a hard time changing up things around here so I don't know if I could sneek some in and get away with it. 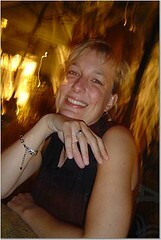 Love all your photo's here! I love your picture of the canned goop, hilarious...homemade is always the way to go! Not that your recipe isn't delicious (it is) but I have to say the photo of the cran gel is fabulous - so retro. You have captured its essence very well. do love your picture (note: not the taste) of the canned stuff. i think most people are attached to the taste of it since they grew up with it. hopefully, we can teach the next generation something homemade. right? First time here, looks delish, love to have this on toasted bread. I make mine the same way, too -- except I omit the ginger and the orange juice and use 1/2 cup of orange marmalade. It really is delicious. 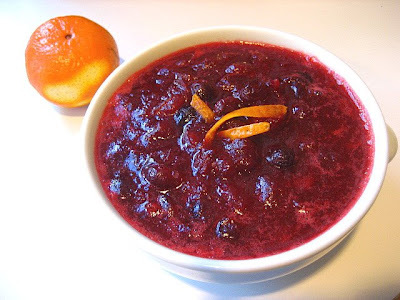 And now, for a shameful confession: I really do love Oceanspray's canned whole berry cranberry sauce (and don't truly mind the jelled stuff, either). I hope you'll still consider me your #1 fan, Stacey. I love the photo of the canned sauce, complete with the indentations from the can! This is the first year I am not serving the canned stuff along with a relish. We will see what they say, I'm kinda thinking my ma will ask where it is??? I love the sound of these flavors and love even more your idea of the crostini with goat cheese and relish!! 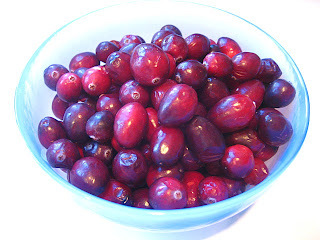 Thank you for the recipe - wonderful flavors for cranberries. On a whim, I put in a sugar-free packet of raspberry Jell-o dissolved in 2 cups of boiling water and then gently stirred in a pint of fresh raspberries and let it set up for 4 or 5 hours. I served it with fresh whipped cream. I guess this makes more of a cranberry sauce/jelly than a relish. The ginger is genius!